If you are a university student, then this is a must read. Since I am a university student, I see everyone printing out every single lecture slide and I think to myself, “What a waste of Paper, ink and trees.” Each student will go through like a realm of paper for each subject, just printing notes out that they will only read once or twice, then throw it out at the end of the year. If you are one of these people I would like you to continue reading how you can save paper, money and ink. 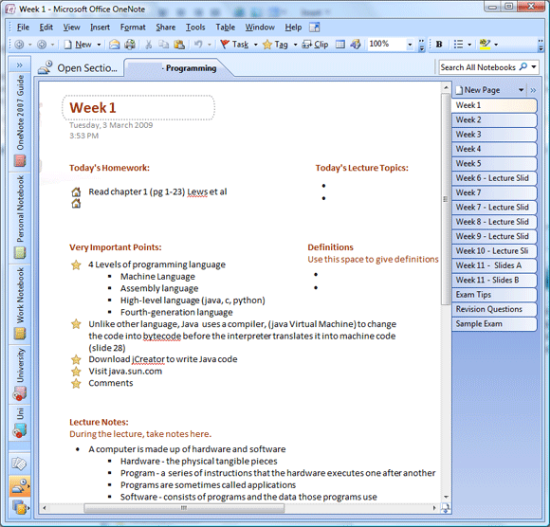 Although Microsoft Office is not free, most people have it, and if you are studying, you can pick it up pretty cheaply for $75 for the full Office edition at ItsNotCheating. This edition contains a program call Microsoft OneNote. If you do not have it, you can get a free 60 day trial from Microsoft. There’s quite of few things that you can use One Note. The main reason is taking notes. I see people use Microsoft Word to take notes, but I suggest to them to use OneNote as you can organise your notes much better and more efficiently. As you can see, each week I have created a new page (see left) and have taken notes off the slides. 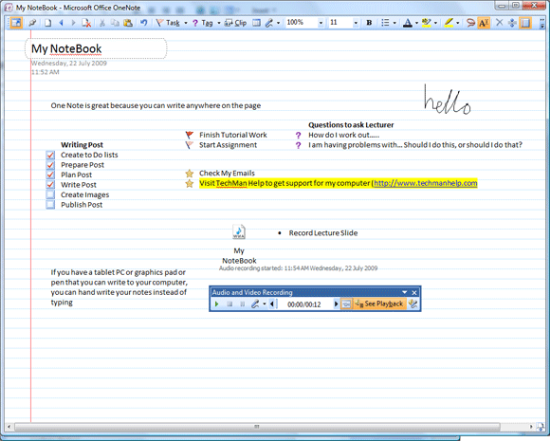 You can organise sub topics such as HomeWork, Lecture Topics and Definitions. I prefer this way rather then having hundreds or one large Word Document. As you can see, in Week 6, I got lazy and I stopped taking notes like this. The lecturer also started drawing on the slides, but since I couldn’t do that because I didn’t have paper, I had to do something about it. I decided to print the lecture slides to One Note. 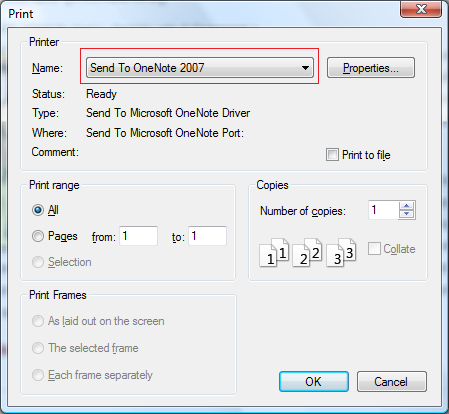 If you have One Note installed on your computer, when you go to print something, you may see a printer called “Send to OneNote 2007”. When you print something to One Note, that page is automatically inserted into One Note for you to take notes on, or draw over. As you can see through the pixilation, there are lecture slides. Since I now have the lecture slides, I can write text, highlight, draw images over the lecture slides and search for text on the slides using the search box in One Note. By printing the slides to One Note, I can now draw or take notes over the slides as if I had pen and paper. The only thing is, I am helping save the environment, and saving money. The only thing I have printed are my assignments while my peers have been printing like mad. So what else can you do with OneNote? Well pretty much take notes, write lists, record audio. 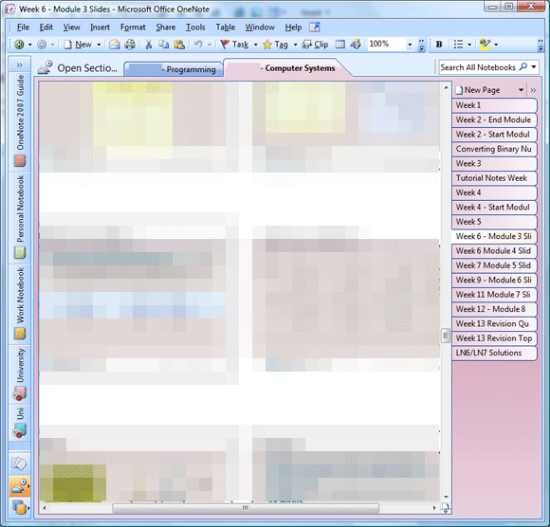 The screenshot below is an example of things that you can do. So University students; If you have a laptop, get Microsoft One Note to save you paper, money and the environment. Do you like this post? Do you use other software to take lecture notes? If you do, then tell us in the comments. thanks so much for writing this…it was very helpful. I’m so confused as to why microsoft doesn’t advertise onenote more as it is very useful. They are losing potential revenue and customers are losing the use of a fantastic product. Ah well…. I wouldn’t think most people would have it because it’s not “bundled” with the standard package of Office. And I don’t think many people will go out of their way to buy it when there are other free alternatives out their – but OneNote has been an essential for me the past 3 years. Great article! 🙂 Had never used OneNote before. But will be trying it out. I always forget to print the lecture slides too! I hope OneNote is a good solution for your needs. Let me know if I can assist in anyway.